One of the biggest challenges for many Salesforce Chatter users is effectively keeping up with their Chatter feed(s) and ensuring that nothing important is missed. For any organization to successfully use Chatter as a communication tool, everyone absolutely must know how to manage and access the information and conversations that are important to them. Without taking the necessary steps to do this, Chatter feeds become chaotic, important conversations are missed by key players, and Chatter quickly loses its value. But fear not, Chatter friends… I have discovered the secret ingredient to ensuring that you can keep up with everything important to you: Chatter email notifications. Yep, you read that correctly – as of today, our email inbox is the best tool we have to help us effectively track and manage our Chatter conversations. Yes indeed, I am a big fan of Chatter email notifications. They are a critical business tool, and if used strategically they will make your Chatter life so much easier. Whether we like it or not, the truth is that we still live in an email-centric world: email is where most of us go first, last, and consistently throughout the day. Rather than trying to fight the email monster head on, let’s embrace our inboxes for the time being & make them work for us. Whenever I make this recommendation, the response I get 95% of the time is: “But isn’t the point of Chatter to reduce the number of emails I receive?” The answer to this question is yes, absolutely! Even with Chatter email notifications in place, the act of simply using Chatter will reduce the number of emails that you receive. In summary: receiving a Chatter email notification is not the same thing as receiving an email, and is in fact preferable because the call to action is in your own hands. You are less likely to miss things that are truly important! 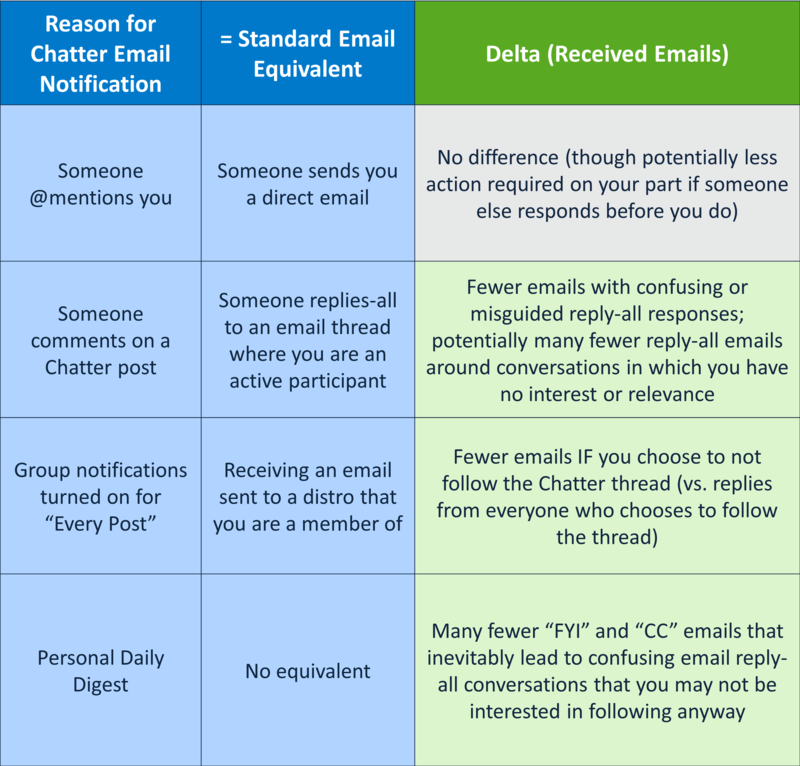 My goal with this post was to make the argument that there is significant value in using Chatter email notifications. With this foundation in place, my next post (Part 2) will reveal my specific Chatter email notifications strategy that make keeping up with Chatter feeds a breeze! It’s hard to find your page in google. I found it on 13 spot, you should build quality backlinks , it will help you to rank to google top 10.